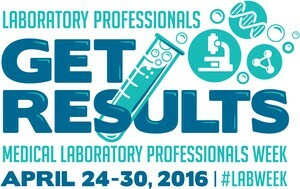 Celebrate “Lab Week” with MRH! Laboratory professionals work to the highest standards for quality and patient safety. They get results, and deliver their knowledge and expertise to ensure patients get the most accurate diagnosis and most appropriate treatment. They are a critical component of the larger healthcare community. This week is dedicated to the men and women of Millinocket Regional Hospital’s Chapman Laboratory. Patients who come to the laboratory this week will receive a little surprise. The laboratory department of the hospital was named the Chapman Laboratory in April of 1995 to honor the memory of Dr. Frank C. Chapman, who was the medical director from 1974 – 1979. The Millinocket Regional Hospital’s laboratory supports clinicians’ decision making in providing patient care by producing and interpreting diagnostic information from analysis of patient specimens. Services offered by the clinical laboratory include, but are not limited to, the following: Blood banking, Chemistry, Hematology, Coagulation, Microbiology, Serology, Body Fluid Analysis, Therapeutic Drug Monitoring, Bedside Glucose Monitoring, and Frozen Sections. Histology, Cytology, and Flow Cytometry are provided by Dahl-Chase Diagnostic Services. Most referral laboratory work is performed by Quest Diagnostics in Marlborough, MA. We are linked by courier and computer, producing quick turn around times. Chapman Laboratory serves Katahdin Healthcare and various physician practices and clinics. Testing is also performed for clients of the various Katahdin area home health agencies. Laboratory outpatient hours are 7 am to 6 pm Monday to Friday, and 8 am to 1 pm on Saturday. Appointments can be made outside these hours. Patient visits for the fiscal year 2015 (July 2014 – June 2015) totaled 23,651. These included: 16,097 outpatient visits; 4,289 emergency room visits; 3,265 inpatient visits. Over 104,600 procedures were performed for these patients. Chapman Laboratory staff include Medical Technologists, Clinical Laboratory Technologists, Medical Laboratory Technicians, Specimen Coordinators, and Clerks. All personnel have degrees / certifications / registrations. The Medical Director of the laboratory is David E Renedo, MD, of Dahl-Chase Pathology Associates, along with Beth Allen, Technical Consultant. Laboratory Manager is Betsey Kelley; Assistant Laboratory Manager is Jane Lewin; Chemistry Section Supervisor is Linda Sickler. Collectively, these five represent over 175 years of clinical laboratory experience. Norma Jowdry, Karen Blackburn, Linda LaBrie, Diana King, Lucie Mallett, Tori McGraw, Scott Perrin, Jon VanDine, Theresa Thompson, Diana Busque, Lori Boynton, Sarah Fiedler, and Alycia Grieco make up the rest of the team.